Check this page for an overview of HRV4Training's main features. Then browse the list of FAQ in this page. Each question points to comprehensive blog posts where we discuss each topic in greater detail. You can also find a guide for HRV4Training Pro, here. For a primer on HRV, go to this blog entry. You can also find an overview of HRV4Training, from the physiological underpinnings of HRV to training adaptation and prescription in this deck. Finally, for more information on the physiology as well as an overview of the current technologies and applications, even outside of the context of sports, check out this presentation we put together. What can HRV4Training offer beyond daily measurements? Weekly and monthly summaries: pick the metric most representative of your athlete's trainings (e.g. RPE, TSS, Suffer Score, training distance) and analyze training load breakdowns by week and month to keep better track of overall progress. Acute HRV changes in response to training and other stressors: systematic analysis of day to day changes in HRV on days following training, alcohol intake, travel, menstruation and sick days. Are your athletes physiologically rested after rest days and easy training? What drop in HRV can you expect after an intense training? How does travel affect their physiology? HRV trends: provide more insights on the big picture. Look at baseline changes on multiple parameters relevant to your physical condition (e.g. HRV, HRV, coefficient of variation, training load), etc. The app can automatically determine if your recent HR orHRV trend is changing in a trivial way, or if the change is something to take more seriously, based on your historical data. Correlations: mainly for exploratory analysis inside the app. Look at what factors are related to physiological changes, and try to adjust your lifestyle accordingly (a good one is typically sleep quality). Training load analysis: you can pick the metric most representative of your trainings (e.g. TSS, Suffer Score, training distance or your own custom metric) and analyze fitness & fatigue, determined as chronic and acute training loads, as well as readiness to perform and injury risk. VO2max estimation: for runners and cyclists using the Strava integration and training with a HR monitor (and power), HRV4Training can estimate cardiorespiratory fitness level (VO2max). Check out this post for more details and our publication showing a strong agreement between real life running performance and estimated VO2max. Training polarization analysis: This analysis allows you to get an overview of how hard you are training and potentially polarize more your training, as a more polarized approach, typically involving training about 80% of the time at very low intensities, has been shown to improve performance for both recreational and elite athletes. More details on this analysis at this link. Lactate threshold estimation: Improve your training pacing and racing strategies based on your estimated lactate threshold. Check out this post for an overview of the science behind our estimate and how you can use it. Check out the quickstart page for an overview of these features. What do I get more using HRV4Training Pro? HRV4Training Pro is the ultimate platform to help you analyze and interpret your physiological data. You can learn more here and find a guide here. In particular, we highly recommend relying in the Overview page in Pro, to look at the big picture. In this visualization you can easily determine when HRV is below normal values (a good time to hold back) while keeping an eye on training load and subjective metrics as well. Learn more about the Overview page, here. For endurance athletes, Pro offers plenty of additional insights to determine how your training is progressing, see for example the intervals analysis, or aerobic efficiency and cardiac decoupling. HRV4Training Pro provides a training planning feature integrated with HRV as well, which you can find here. Some of these features are currently in Beta, simply drop us a line to get it activated for your account. Finally, HRV4Training Pro provides a coach panel for teams to manage athletes remotely and analyze or export physiological data. You can try Pro for free by logging in here. For the camera version you will need an iPhone 5 or later (all versions). The 4S is not supported anymore. If you use a bluetooth low energy sensor, any device will work, from iPads to iPods and iPhones 4S. Just make sure you use a sensor that is reliable, for example a Polar H7. On Android, most phones released in the past few years should work fine, we tested quite a few. If your phone is 4-5 years old, it might not work, however the app is able to detect it and it will inform you. Check this post for more details on the camera measurement on Android and this post for a validation with respect to chest straps. ​In our tests, the following devices performed well: Google Pixel, Hawei P20 and P20 Pro (we recently released updates to deal with these multi-camera phones), Samsung S5, Samsung S6, Samsung Galaxy S7, Galaxy S3 Neo, Galaxy J7, Samsung Galaxy Note 4, Xiaomi Redmi Note 4 Plus, Xiaomi Redmi Note 3 PRO, HTC A9, LG Nexus 5, LG Nexus 5X, Motorola Nexus 6, Alcatel Pixi, Moto G 3rd Gen Turbo Edition XT1557, LG G2, Samsung Galaxy A3 (Android 5, 6, 7). On the other hand, the following devices were unable to keep up with our algorithms: Samsung S3, S4, Huawei P8, Konnect 501. Additionally, some devices have been reported to get warm around the flash, for example the Moto G5, and for this reason we introduced a shorter measurement (45 seconds). Finally, Android phones with dual cameras might not work. Obviously, this is not an exhaustive list, however the app will be able to detect if your phone is able to keep up and inform you. At that point, in case of negative outcome, if you are not willing to use a chest strap, you can always get a refund via the Google Play Store or contact us to get your refund, that's never a problem. What sensor should I use? Short answer: rely on the phone camera or get a Polar H7. A validation paper of our camera based algorithms can be found at this link. Long answer: read this post where I compared wrist worn sensors (e.g. a Mio Alpha) and chest worn sensors (e.g. a Polar H7) to a regular ECG device. HRV4Training can now be used to read HRV data from the Health app, convert that data (SDNN) to Recovery Points (a more readable metric), and analyze your physiology similarly to what we normally do when you measure using the phone camera or an external Bluetooth sensor. How accurate is the camera version? Most importantly, check out the next FAQ for tips on how to use the camera properly, since it does take a few measurements to get familiar with it. You can also practice any time from Menu / Resources / Camera measurement practice mode. What's the best way to use the camera measurement? See this post for a series of tips on how to make the most out of your camera measurement. When should i take the HRV measurement? Short answer: in the morning, right after waking up, so that you can limit the effect of other stressors, similarly to what we would do in laboratory protocols & clinical studies. Long answer: read this post in which I cover HRV measurements, context and time of the recording. Short answer: relax and breathe freely. Self-pacing seems to be ideal, as each person might have a preferred way of breathing. The important point is not to force your breathing or make any effort to try to breathe particularly deep or in an unnatural way. Simply relax and self-pace your breathing. Long answer: for a broader discussion on this topic, check out this blog post. Can I measure multiple times per day? No, at the moment you can measure only once per day. Making HRV measurement a morning routine, and being consistent (see this post) are key factors to make sure your data can be used to perform meaningful analysis. This being said, if you are a HRV4Training user and would like to experiment more, we are happy to send you a promo code for Camera HRV (also available on Android), so that you can download it for free. Just email us at this email address, specifying your current HRV4Training registered email. How long should the measurement last? Short answer: 60 seconds are sufficient for a reliable measurement of rMSSD and therefore of HRV4T Recovery points. Long answer: read this post in which I analyzed HRV measurements from 10 seconds to 5 minutes, to determine the reliability of different time windows. What is the daily advice and how is it computed? What can it tell me? The daily advice combines your HRV with respect to your normal values, your subjective scores and your recent trends to provide daily guidance. You can find out more at this blog post. Why is my heart rate fluctuating so much during a measurement? In HRV4Training what we measure are beat to beat differences (also called RR intervals), and what we show is instantaneous heart rate. RR intervals cover a broad range during a breathing cycle, you might also have noticed that while breathing out the instantaneous HR lowers, while it raises while breathing in. You might be surprised by the big range of values covered while measuring using HRV4Training because normally most devices measuring HR through an app, show you averaged data, such as HR averaged over the past 15 or 30 seconds. By definition, your average heart rate over the past 15 or 30 seconds is much less jumpy. As we measure HRV variability, we prefer to provide instantaneous heart rate as visual feedback instead of averaged heart rate. Check out the data below for an example. As you can see RR intervals go from 1000 to almost 1800ms. Heart rate is the inverse of the RR interval over a minute, so we can derive instantaneous heart rate as 60000/1000 = 60 bpm and 60000/1800 = 33 bpm. This is an extreme case of high HRV, showing a variation of almost 30 beats over a breathing cycle. If we were to take the past 15-30 seconds and show average heart rate, you'd probably see something in the range of 40-50 bpm, as other devices would report it. Note also that when using a chest strap the same relation holds. The standard bluetooth low energy protocol provides data in a packet which starts with your average heart rate, and then appends all RR intervals detected in the past second (zero or more). Most apps would take the heart rate sent by the polar and display it, thus showing you averaged information. On the other hand, HRV4Training takes the last RR interval received and computes your instantaneous heart rate as shown above, to provide you with real-time feedback on beat to beat variability. Should I do single or orthostatic measurements? Short answer: single HRV measurements are sufficient to monitor day to day training load and recovery. Long answer: read this post in which I analyzed data from HRV4Training users, showing that single measurements, either lying or standing, provide accurate assessment of training load, while "traditional" orthostatic measurements do not seem to provide additional help in guiding day to day training. What are normal values for HRV? HRV normal values cover a very broad range and tend to lower with age. While some parameters like age and fitness influence your HRV, your baseline is also affected by other factors more difficult to measure, such as genetics. For a more detailed discussion on normal values, check out this blog post (and this older one). What are the HRV4Training Recovery Points and what features should I look at? Recovery Points are based on rMSSD. In general try to look at rMSSD or HF as features representative of parasympathetic activity, both of them showing higher values when you are in a more relaxed, less physiologically stressed state. See this post for more details. There are some advantages in focusing on time domain features, such as rMSSD, you can read more in this blog post. Can a high score be bad? Normally a higher score indicates relatively lower stress, however we take sometimes a more statistical approach in which we interpret everything that is "not normal" (particularly low or high), with respect to your historical data, as something to be more cautious about, especially if subjective scores (sleep, motivation, perceived performance) are not trending well. This article (simplifaster.com/articles/interpreting-hrv-trends-athletes/) on the topic could also help in understanding less typical patterns such as when higher scores are not to be considered positive or low scores negative. Keep in mind that these are uncommon situations and normally we would consider a higher score positively, and a lower one negatively, as that's how higher stress level is reflected at the physiological level. At this link you can find more information specifically on how we build the daily advice. Is HRV4Training performing any correction for ectopic beats and motion artifacts? Short answer: yes, HRV4Training performs RR interval correction to deal with ectopic beats and motion artifacts. Long answer: see this blog post to find out more about RR interval correction, ectopic beats, motion artifacts and how we deal with these issues in ECG, Polar and PPG data. EDIT: we recently improved our algorithms using more complex methods able to deal better with artifacts without overcorrecting in individuals with particularly high rMSSD. Feel free to contact us if you'd like to know more. I measured twice in a row and my measurements were different. What does it mean? Daily measurements taken in succession can vary, and variations of 5 - 20 ms or 0.5 recovery points are perfectly normal, simply because our physiology is never in the same state. 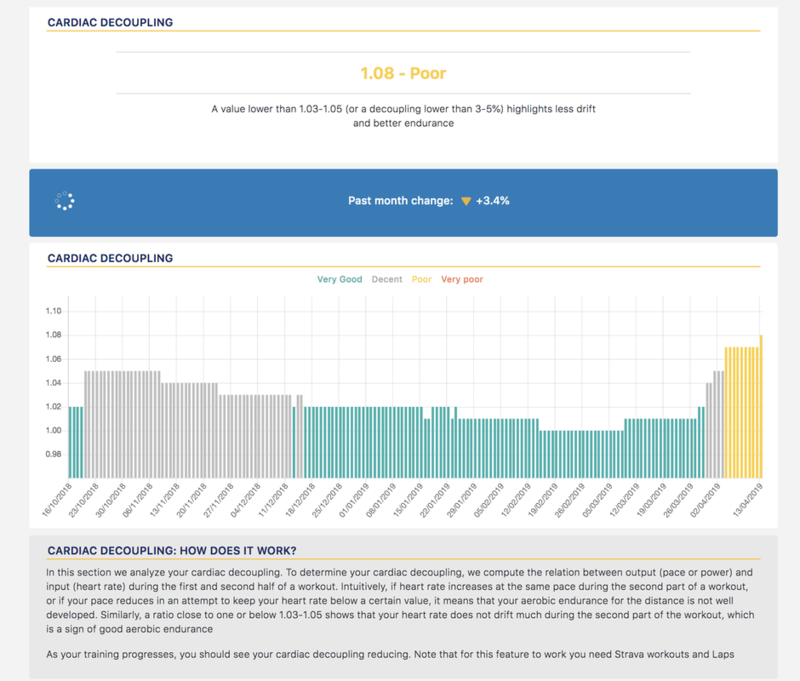 Thus, HRV4Training uses your historical data, as much as the past 2 months of data, to understand what are normal variations for you and provide meaningful daily advice regardless of these variations. For a broader discussion of this topic and some data from our clinical studies showing the effect of measurement duration and paced breathing on measurement repeatability, check out this blog post. Can I record more than one workout per day? We currently support multisport activities (manually or automatically read from Strava) for triathlon combinations as well as other workouts supported in the Strava and Training Peaks integration. We also support custom tags (or annotations) so that you can code up to three different parameters that are particuarly relevant to your lifestyle or training. Each numerical custom parameter could be coded to log additional workouts, for example as 1/0. How do I use HRV to adjust or guide training? The example we’ve just highlighted is something we all understand quite well, higher stress as shown by lower HRV highlights how it might be a good idea to take it easy and avoid excessive stress which might lead to overtraining or slower recoveries, hindering improvements in performance. What do you do when it’s all good? Should you push it all the time because your HRV is within normal values, often shown in apps as a green light? Of course not. The fact that your body is in a (physiologically speaking) normal state, is what you should aim for. Normal is good. However, this does not mean that every time HRV looks good you should go hard. You first need to have a plan, then you can make adjustments based on how you respond to such plan, which is something HRV and physiological measurements can allow you to do, by providing feedback on your individual specific physiological response to your training plan. You can learn more about the latest research on HRV-guided training planning, at this link. How does the alarm / reminder work? Reminders were not included HRV4Training for a long time, mainly because we think they do not really work when timing is so important for consistency. You probably wake up at consistent times but not always at the exact same time and a reminder would always be at the same time. Nevertheless, we recently introduced local notifications as reminders, and here is how they work: as we cannot schedule a regular alarm, similarly to the iPhone alarm clock app, but only use local notifications, you will see HRV4Training notifications do not trigger sounds if your phone is in vibration/silent mode. However, the notification stays in your screen and shows up together with your other notifications, and therefore it can still be useful if you grab your phone first thing in the morning and see it. Hence, we decided to include it this way, hoping it provides some help. Does HRV4Training share data with other apps & services? Strava: HRV4Training can read your workouts summaries, show them in your History page and fill in automatically some of the training-related tags for you, as explained here. Strava data is also used to estimate VO2max for runners and cyclists using a heart rate monitor (and power) during training. TrainingPeaks: HRV4Training can send HR, HRV and additional parameters (notes, sleep, muscle soreness, etc. ) to TrainingPeaks, as explained here. SportTracks: HRV4Training can send HR and HRV data to SportTracks, as explained here. Genetrainer: HRV4Training can send HR and HRV data to Genetrainer, as explained here. Health: HRV4Training can send HR and sleep data to the Health app as well as read sleep data from the Health app in case you use another sleep tracker. Today's Plan: HRV4Training can send HR and HRV data to Today's Plan. Learn more about this integration here. Final Surge: HRV4Training can send HR and HRV data to Final Surge. Learn more about this integration here. TrainAsOne: HRV4Training can send HR and HRV data to TrainAsOne. Learn more about this integration here. Oura ring: HRV4Training can read HR, HRV and sleep data from Oura. Learn more about this integration here.